When you’re hosting a gala or a party, building the right menu is essential. 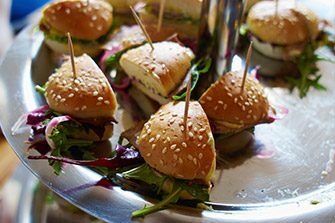 Caterers have made the task easier by serving up bold, outside-the-box, and local options. With the perfect menu, the food presentation can’t be an afterthought. Plus – thoughtful food presentation gives any event Instagram-worthy optics! We’re seeing event designers display food in a way that it’s never been displayed. 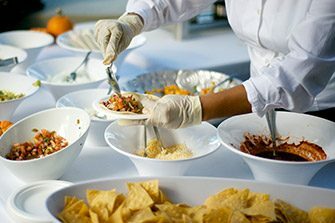 Whether it’s a brunch buffet or a mouth-watering taco bar, having your serving dishes displayed at unique heights on the table helps to draw guests in. Elevated food creates a great visual and it’s absolutely engaging! For the perfect hors d’oeuvres, take classic comfort food and shrink it. We’ve seen – and loved – Reuben sliders, soup shooters, and even small Caesar salads. 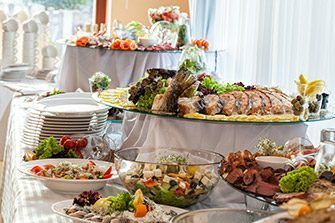 From build-your-own hamburgers to omelet bars, food stations make a great topic for conversation. The best case is several action stations, so guests can move around and get a flavor for an entire event. It makes for wonderful interaction between people! If your market is new to the trend, Decatur recommends adding a carving action station to the standard buffet. Keep it simple – have a chef carving a roast, and toppings on the side that are elevated. Decatur is seeing event caterers serve desserts in bite-size portions. This includes unusual options such as crème brûlée or Key lime pie! 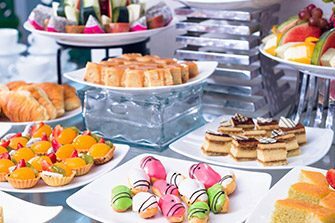 We love the trend because it means event hosts can serve many desserts at dessert stations around the venue, and guests are encouraged to mingle. To create a dynamic look, display three or four treats at varying heights. Desserts can be served on trays or in a 4 or 5 oz. dish that complements the individual item. For our clients, we’ve been providing glass Mason jars, shooters, or any other dish that’s small or handheld. Keep guests moving around the event space by renting both highboy tables and standard rounds. 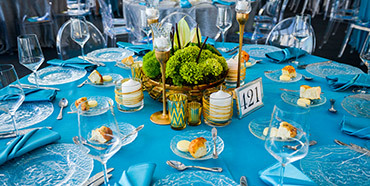 For details, check out our Quick List – 5 Table Rentals You Need to Remember.